Sydney-based developer Nnooo is likely to be a familiar name to Nintendo download enthusiasts, with a number of releases on WiiWare, DSiWare and the excellent escapeVektor on the 3DS eShop. In recent times the company has taken on the role of publisher for two upcoming releases, but has today confirmed its next in-house project; it's a bit different from some of its previous efforts. Coming to the 3DS eShop, as well as PS4 and Vita, is Blast 'em Bunnies, a pick up and play shooter where you do pretty much as the title suggests — you blast bunnies. They are evil bunnies, in fairness, and you defend your burrow with a variety of weapons and, occasionally, try to save your own baby bunnies. Here's what Nnooo's Creative Director, Nic Watt, has said in the official press release. 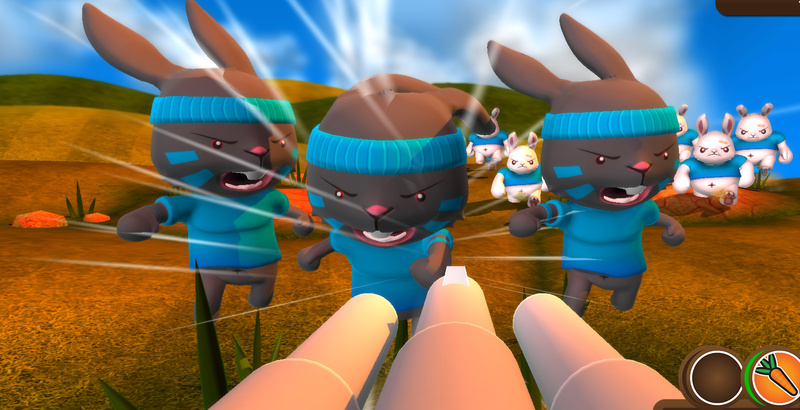 Blast 'Em Bunnies is a pick-up-and-play endless shooter...with bunnies. You have to keep your bunny alive as long as you can. The longer you play, the more difficult survival becomes. But it's not just your own bunny's mortality you're concerned with. You also need to deal with the throat slitter who is holding your baby bunnies hostage. He'll pop up every now and again with one of your little 'uns. Kill him quickly and the baby bunny escapes. If you're not quick enough...well, I really don't want to talk about it. This looks like harmless fun in the trailer below, though the fate of baby bunnies seems a bit, well, potentially disturbing. Due in 2014, check it out below and let us know what you think and, in the name of all things holy, make sure you save the baby bunnies. It certainly looks very "pick-up-and-play". I'd consider it if the price is right. Looks kinda fun but repetitive. Will there be gyro controls? This looks actually kind of fun. I need a review first though. @accc I wonder that too. It seems like a really good fit for this game. @accc: Gyro controls are in, I've played it myself (on PS4) but they've created the game with other platforms in mind.